It’s always exciting to see the latest and greatest that companies like Samsung, HTC, LG, and Sony have to offer, but in the last year or two, there has been a proliferation of lesser known companies, mostly based in China, that have decided to take the fight to the “big” OEMs by offering devices that boast specifications that are quite similar to what you’d get from high-end smartphones, but at a far more affordable price tag. Having a relatively low-cost device with a 1080p display isn’t a pipe dream any more, and quad-core processors, albeit underpowered, are becoming a staple feature of devices that are being marketed as mid-range phones. One such company, that had a great showing at this year’s CES, is Alcatel, that released the well-received Idol X last year, and in its hope to continue to grow in a saturated smartphone market, the company has followed that up with another fine release, the Alcatel OneTouch Idol X+. As always, you get a smartphone with some good specifications and of course, an affordable price tag, but as we’ve seen with phones like the Nexus 5 and even the Nexus 4 before it, and, more recently, the OnePlus One, competition in this particular segment is more intense than ever. So does the latest Alcatel offering pack enough of a punch to stack up favourably against the competition? 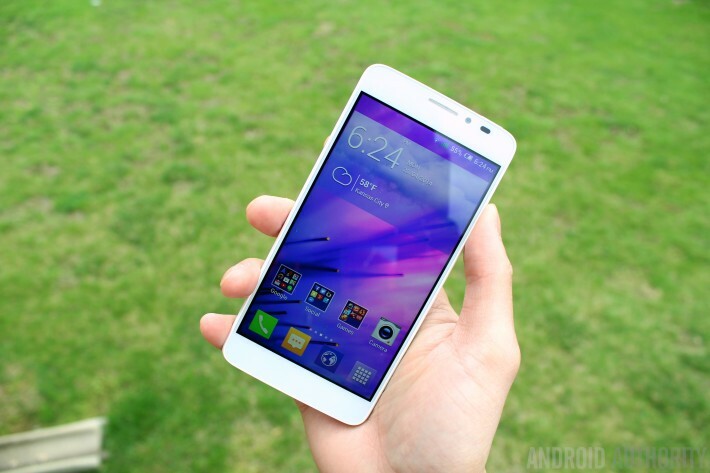 We find out, in this comprehensive review of the Alcatel OneTouch Idol X+! The Alcatel OneTouch Idol X+ may not have the most unique design in the world, and by looking at it, you can definitely tell where the inspiration came from, but that of course doesn’t mean that it’s a poorly designed smartphone. The build material is a combination of glossy plastic at the back, and an aluminium frame around the perimeter of the phone that actually makes it feel pretty solid in the hand, despite it being fairly light at 130 grams, and being quite thin at 7.9 mm. That being said, the glossy plastic back is a fingerprint magnet, which results in it being rather slippery. The front of the phone is dominated by the display with my favorite part about the design being the super thin bezels to the left and right of the display, enabling the screen to really shine through. You’ll find a 2 MP camera next to the earpiece and typical sensors, a LED notification light that’s hidden unless it’s lit up, and capacitive back, home, and menu keys along the bottom. Going around the phone, on the top is the power button with a 3.5 mm headset jack, and along the bottom is where you’ll find the micro-USB port and a single speaker with a microphone that is disguised to look like a second speaker, probably to maintain the aesthetic. There is a single SIM card slot on the left side, which is opened by applying pressure towards the top of the door and held shut with a magnet, and on the other side is a secondary SIM slot above the volume rocker. The super thin bezels along the side of the phone and its relative thinness work in concert to create a phone that is smaller and more compact than a lot of other smartphones featuring a display with a similar size, resulting in a display that’s comfortably reachable across the device. The Alcatel OneTouch Idol X+ is a solidly built device, and the fingerprint prone and somewhat slippery nature of the backplate is the only minor downside to an otherwise good handling experience. As mentioned before, expecting a smartphone at this price range to feature a 1080p display is not unreasonable, and this is exactly what you get with the Alcatel OneTouch Idol X+, that boasts a 5-inch IPS LCD display with 1920 x 1080 resolution, resulting in a pixel density of 441 ppi. I find the device to be quite good looking, in fact. It’s display is vibrant. Graphics and text look really sharp with very nice color reproduction without looking over-saturated. Brightness isn’t an issue, and the display can be used quite comfortably when outdoors, and the viewing angles are fantastic with very little loss in clarity even at sharp angles. Overall, you’ll have a great time using this display, be it to surf the web, watch movies, or play games. Under the hood, the Alcatel OneTouch Idol X+ is rocking an octa-core MediaTek MT6592 processor clocked at 2 GHz, backed by the Mali 450 GPU and 2 GB of RAM. It also comes with 16 GB or 32 GB internal storage options, which is unfortunately not expandable. The processor is one of a kind, with it being a true octa-core processor, meaning that eight cores are actually being used at the same time. This is different from what Samsung is doing with the Exynos 5 Octa processor, which is essentially two quad-core processors that alternate back and forth depending on how processor intensive the task is. This processor sounds like an absolute beast on paper, but it’s based on ARM Cortex-A7 architecture, which is pretty old architecture at this point. The performance of Idol X+ isn’t bad but it could be better, considering what the device offers. It handles regular day to day tasks, like swiping through home screens or opening up apps, with no issues and even does a pretty decent job with graphically intensive games like Dead Trigger 2. You’ll sometimes run into some lag or the occasional dropped frame, which made for a rather inconsistent experience. Web browsing performance also requires some improvement, as there are rendering issues, especially when scrolling through a page quickly, even on the default web browser. When it comes to the speaker that is found along the bottom, it is actually pretty loud with great clarity, even if it is a single speaker. Being mounted on the bottom though means you’re going to get sideways firing audio when watching videos or playing games in landscape orientation, making the speaker extremely easy to cover up, muffling the sound. Despite its performance issues, the phone has been solid in terms of battery life. The Idol X+ comes with a non-removable 2,500 mAh battery, and I was able to get nearly all day battery life with it. I was mostly connected to WiFi due to the lack of connectivity support, but I was able to get between 18 to 20 hours off the charger with my usage, which equated to almost 5 hours of screen on time. I was pleasantly surprised with the battery performance, since a battery capacity of 2,500 mAh is deemed somewhat small in comparison to many other smartphones out there. Unfortunately, when it comes to mobile network connectivity Alcatel dropped the ball–that is, if you’re hoping to pick up this phone in the US. The Idol X+ lacks LTE, which is something we do see with other similar devices, and it also doesn’t support any 3G bands on US carriers like T-Mobile or AT&T. During my time with the phone, I was relegated to using EDGE data, which led to an understandably frustrating experience. Another strong aspect of the Alcatel OneTouch Idol X+ is its 13 MP rear camera. The camera app is pretty simplistic and straight forward, with a few shooting modes available, such as HDR, panorama, night mode, and sports mode, with more advanced options like ISO and exposure that lets you play around with the settings to help get a better shot. Surprisingly, the camera takes very nice looking photos that are very sharp and with color reproduction that is very true to life. It’s not without its issues though, as it doesn’t have the fastest shutter speed in the world, and taking photos of moving objects, even slow ones, will result in blurry images. Overall, the camera does perform like I’d expected, and does a decent job in low light conditions as well, without creating too much noise. As far as the software is concerned, the Idol X+ runs Android 4.2.2 Jelly Bean, and it’s always a little disappointing to see an older version of the OS on a current device, and in this case, not only is it not the latest version of Android, it’s not even the most recent iteration of Jelly Bean. I’m also skeptical about the likelihood of software updates – something else to watch out for. On top of Android 4.2.2 is Alcatel’s OneTouch UI, which is full of very bright and colorful looking icons with transparencies in the UI elements, like what you’d see in the folders and notification shade. Alcatel does include some rather interesting features, like a vertical scrolling home screen that is dedicated purely to widgets, and another home screen that give you a quick view of the images in your gallery. Of course, both of these screens can be removed if you don’t like them. The user interface isn’t the most intrusive, or the heaviest skin out there as it does preserve some elements from stock Android, like the app drawer and settings menu. While the color scheme is a little different, the overall look has been left intact. You can check out the different aspects of the software in the gallery below. When the phone is working properly it’s actually quite good, but unfortunately, the OneTouch UI is full of bugs, that sometimes causes the phone to lock up, or just requires you to force close the launcher altogether. Alcatel definitely has their work cut out for them in the software department, as the overall performance leaves a lot to be desired. So there you have it – the Alcatel OneTouch Idol X+. It’s available now for below $400 off contract but it’s a rather steep price to pay for a phone with no LTE, lack of 3G support with carriers in the US, and the low probability of software updates. As mentioned in the introduction, competition in this price segment is a lot stiffer now, with some great options such as the Nexus 5, Moto G, Moto X, and the recently announced OnePlus One offering an admittedly better experience at the same price point, if not cheaper. Overall, the Alcatel Idol X+ offers some very decent hardware, like the beautiful display and good camera, but suffers from way too many shortcomings to make it a viable option against the other smartphones in this price range, taking away any competitive edge that this phone might have had.